Photo from the fourth annual meeting,September 17-19, 2013 in Schaumburg, IL. 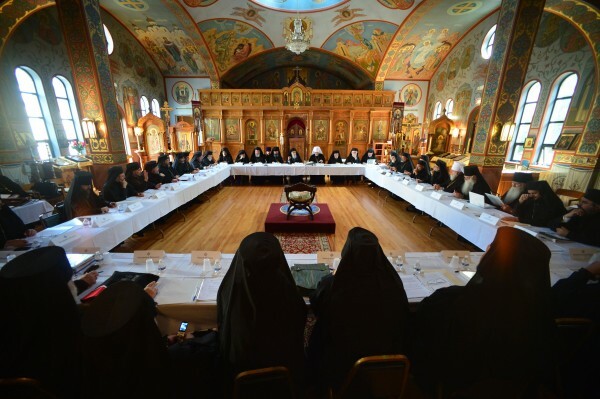 In just one week, the Assembly of Canonical Orthodox Bishops of the United States of America will convene for its fifth annual meeting. From September 15-18, the hierarchs who shepherd the Orthodox faithful in our blessed country will express our common faith and our unity in Christ. Moreover, our gathering together as bishops with diverse cultural traditions offers the world a visible and tangible expression of the profound depth of Orthodoxy. The meeting this year will also include a pan-Orthodox gathering of the clergy and laity of the region. This offers the entire body of the Church: the bishop, the presbyteriat and the laity, the opportunity to glorify God and to offer thanksgiving for His great gift of Holy Communion. O Lord of Heaven and Earth and of all who dwell therein, we beseech You on behalf of all the Hierarchs of the Assembly of Canonical Orthodox Bishops of the United States of America who gather in solemn convocation. Make their travel to and from their meeting safe and sound; direct their deliberations to the glory of Your Holy Name and the benefit of Your Holy Church; grant unto them a fraternal spirit founded in Your love and Your grace, that in all they do and say, they may bring all honor, praise and glory to Your Name, of the Father, and of the Son, and of the Holy Spirit, now and ever, and unto the ages of ages. Amen.